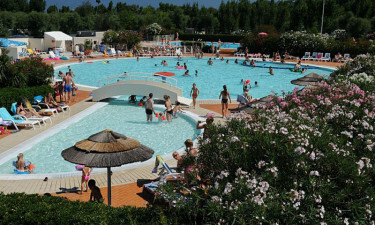 This luxury camping site is able to offer one of the most unforgettable holidays in Italy. Boasting numerous on-site activities as well as only the most modern of accommodations, Spina Camping Village can provide the holiday camping experience of a lifetime. Need more convincing? Just get in touch with a LUX-camp representative today. Why Should I Select the Holiday Camping Site of Spina Camping Village? A choice of 650 private pitches and quality mobile homes. Dogs are allowed during all seasons. No less than 24 hectares of peace and relaxation. One of the advantages of this luxury camping site is that guests can enjoy many leisure activities that are only a short distance away from their mobile homes. With facilities for swimming, tennis, bicycle hire and table tennis, there are even a number of options available for those moments of peace and quiet. A sauna and a tranquil indoor pool will undoubtedly cater to such needs. A camping holiday here is made even more enjoyable thanks to all of the conveniences that are moments away. Those who hope to bring their children along will be pleased to know that there are baby changing facilities within the site itself. Also, entertainment will be provided for this younger generation. Wireless Internet is provided at no extra charge and standalone power supplies are offered to each of the mobile homes. One of the most unique aspects of this luxury camping resort is its use of a pool with a sand floor, which means guests can feel as if they were at the beach without ever having to stray far from their pitch – the ultimate tropical getaway feel! Over 620 square metres of water ensures that overcrowding is never an issue and as the depths of the pool are progressive, safety is always the top priority. Other benefits of this pool include two separate water slides for children and relaxing massage jets for adults. The sense of camping luxury that Spina Camping Village provides is only heightened by the presence of an on-site restaurant and a bespoke bar. Both regional and international dishes are served here; ideal for those who’d prefer a taste of home after sampling some Italian delicacies. 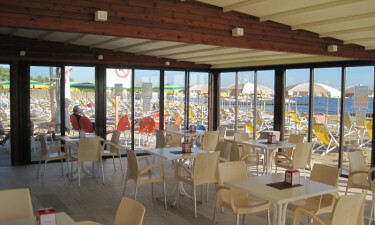 This beach restaurant enables its guests to dine in the open air; a welcome opportunity when enjoying the warm Italian sun. The bar serves up tasty local wines as well as a choice of the finest cocktails. Finally, all of the menu options are amenably priced. 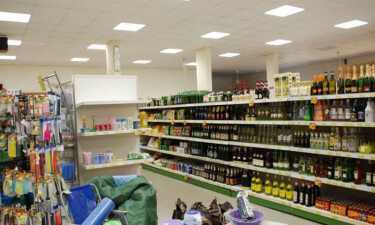 While a takeaway menu is available for all guests, there is also a supermarket that will provide fresh fruits and vegetables, baked bread, pastries and other common produce items. Camping essentials and international newspapers add a further sense of convenience to this luxury camping resort. As with the other facilities here, this small retail centre is located only moments away from all mobile homes. Please contact LUX-camp for more details or if there are any additional questions.